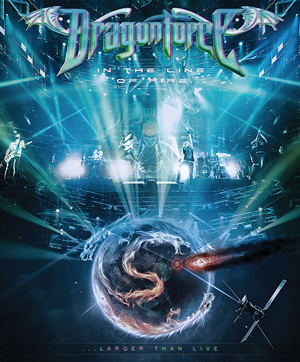 Multi-national metal maestro's DRAGONFORCE have announced the worldwide release of their debut DVD entitled In the Line of Fire. The release is scheduled for July 10th and features high definition footage shot during the band's Ultimate Stage headline show at 2014's Loud Park Festival in the Saitama Super Arena, Japan, the band used multiple camera angles to capture the raw energy of their show and instrumental dexterity for which they are rightly celebrated worldwide. Watch the trailer for In The Line Of Fire below and pre-order your copy now at metalblade.com/dragonforce. The track listing below features a selection of new songs from the latest album Maximum Overload mixed in with foot stomping anthems and lightning fast shred-fests from previous releases. The video also includes backstage, behind the scenes, and off tour footage to give fans an insight into the Maximum Overload World Tour. Mix and Mastered by Damien Rainaud in Los Angeles, CA. Produced and edited by Herman Li. DRAGONFORCE are currently on the Maximum Overload World Tour, which commenced in September 2014 and is due to conclude in 2016. Throughout their six studio album and multiple world tour history, DF have steadfastly refused to shoot a DVD, until now. Guitarist Herman Li explains, "We always held the opinion that if we ever did a DVD we wanted to do it properly. Now, having released six studio albums we thought we had a great cross section of material to pick from and we knew the facilities at Loud Park made it a great place to film a show. Everything just came together and we're very pleased with the results and hope the fans will be also." A snapshot of the DVD can be seen by checking out the just released second music video from Maximum Overload; a storming version of "Three Hammers" which was shot at the same show! Watch "Three Hammers" right HERE. The release will be a double disc package of the DVD and accompanying Live Audio CD of the show and will also be available in Blu-Ray.